The Newport Pop Festival, held in Costa Mesa, California, on August 3–4, 1968, was the first music concert ever to have more than 100,000 paid attendees. Its sequel, billed as Newport 69, was held in Northridge, California, on June 20–22, 1969, and had a total attendance estimated at 200,000. There were two separate events staged in the late 1960s that are commonly referred to as the "Newport Pop Festival." The first was called the Newport Pop Festival, held at the Orange County Fairgrounds in Costa Mesa, California, on the weekend of August 3–4, 1968. The second event was originally billed as "Newport 69," and was held over the three-day weekend of June 20–22, 1969 in Northridge, California, at Devonshire Downs. In published writings over the last 40 years, this latter event has been referred to as the "Newport 69 Pop Festival," the "Newport Pop Festival 1969" or simply the "Newport Pop Festival." Subsequently, much confusion has been created over the years between the 1968 and 1969 events. Some of this confusion was generated by the participating musicians themselves who, in later interviews, often mixed up the two events. The latter event was organized by Mark Robinson (age 25), who was one of the three promoters of the original Newport Pop Festival in 1968. The other two promoters of the '68 event were Gary R. Schmidt (age 26) and his father Al Schmidt. Al was not a rock 'n' roller, but rather an entrepreneurial businessman who helped with the money and licensing. There was a brief lawsuit between the two Schmidts and Robinson just prior to the "Newport 69" show, which the Schmidts had declined to be involved in because of the cost of the acts. The entire band budget for the '68 show was under $50,000, while Robinson paid Jimi Hendrix alone $50,000 for the '69 event. This was an amount of money unheard of at that time for a rock act. The '68 show made money and the '69 show did not. The lawsuit was over trade names and, within the last few days before the '69 show, the court ordered that Robinson had to use "not affiliated with the Newport Pop Festival" disclaimers in advertising. Otherwise, he would not have been able to stage a "Newport 70" show using that name. A round flyer with the dimensions of a 45RPM record was used to promote the 1968 Costa Mesa show and is included in "The Art of Rock," a publication of 1960s and 1970s poster art. This flyer has sold on eBay for as much as $500. The first Newport Pop Festival was held at the Orange County Fairgrounds in Costa Mesa, California, on the weekend of August 3–4, 1968. It is believed to have been the first pop music concert with over 100,000 paid attendees. The 1968 event was originally scheduled to be held inside the Orange County Fairgrounds in an outdoor pavilion. The fairgrounds are on Newport Boulevard, just a short distance from Newport Beach (hence the name). The 1968 event's advance ticket sales were triple of what was expected, and it became evident that no area inside the fairgrounds could hold even 25,000 people, let alone the near 100,000 now predicted. In the last three days before the show, it was moved to one of the adjoining parking lots of the fairgrounds. Fencing, staging, sanitation, and food concessions had to be organized within just three days. Fencing in some areas consisted of wire blankets and/or tarps thrown over as a visual block. People without tickets on the outside would "storm the fence" and got in for free. None of the commercial concessionaires were prepared for the event, and they all ran out of food and drink halfway through the first day. Water was provided throughout the event by garden hoses from inside the fairgrounds, but attendees had to provide their own containers and give up their viewing spot to reach the water. A broken water supply pipe provided a mud bath that a number of people jumped in, but people realized that the sun would bake the mud into a hard cover, so they stopped. There were plenty of porta-potties available at the rear of the hastily assembled "grounds." There was no shade in the primary viewing area, and partiers were sunburned. The weather was a typical August day in sunny Southern California. Those without hotel reservations had no place to stay. However, city officials alleviated some of the problems by designating a 32-acre (130,000 m2) area of the fairgrounds as an emergency campsite. They also brought in portable toilets and water tanks. This particular event launched some of the problems rock festival promoters would face in the future. Harvey "Humble Harve" Miller, a Top 40 disc jockey for 93 KHJ-AM in Los Angeles, was hired to promote the show and hosted the event with Wavy Gravy. Wesco Productions (West Coast Productions) consisted of Mark Robinson, Gary Schmidt and Al Schmidt, though Humble Harv was used in advertising for promotional purposes. Tom Neito of Scenic Sounds Productions also assisted in securing the fairgrounds, and was paid a fee and received some promotional billing. Robinson had been involved with Bob Blodget in staging a much smaller but similar weekend festival in 1967 in Los Angeles. There never was a second edition of this event and its prominence faded from memory until, on August 4, 2008, Jeff Overley penned a feature article for the Orange County Register  that commemorated the event's 40th anniversary. The big hits with the crowd included Tiny Tim, Jefferson Airplane, Country Joe McDonald, The Chambers Brothers, and Steppenwolf. Mark Robinson went on to promote a similar "Newport 69" show with Jimi Hendrix and later became an attorney, practicing law with Melvin Belli. Al and Gary teamed up with Bill Quarry, Alfie Zaner and Rich Romello and produced the San Francisco International Pop Festival at the Alameda County Fairgrounds in Pleasanton on October 25–26, 1968. That show drew over 40,000 people and featured Creedence Clearwater Revival, the Chambers Brothers, José Feliciano, Deep Purple, Procol Harum, Johnny Rivers, Iron Butterfly, Eric Burdon and the Animals, Canned Heat, The Grass Roots, Rejoice, and Fraternity of Man. After the show, Al Schmidt continued in non rock 'n' roll business until he died at 83 in the late 1990s. Gary Schmidt entered the nightclub business and continued to promote smaller events throughout Northern California, including two more festivals with attendance in the 25,000–30,000 range: The Labor Day Weekend Music and Arts Festival in Carson City, Nevada in 1972 and Super Sun Bust Summer of 1973 at the Eugene Speedway (Oregon). For some of these productions, Schmidt teamed up with Bill Quarry, a well known early East Bay promoter (see "Teens N Twenties" and "The East Bay Scene, Garage Bands from the '60s, Then and Now"). Schmidt also operated a well-known rock nightclub, the Odyssey Room, in Sunnyvale, California, from 1969 to 1989 (see Odyssey Room Revisited) and a venue just outside Reno, Nevada on Mt. Rose called the Reindeer Lodge which, as of 2010, still hosts occasional shows. Mark Robinson, at the time a Stanford student, promoted a few more concerts and then finished law school. He is now a nationally renowned and accredited attorney, practicing law throughout the United States while keeping a home office in Orange County. 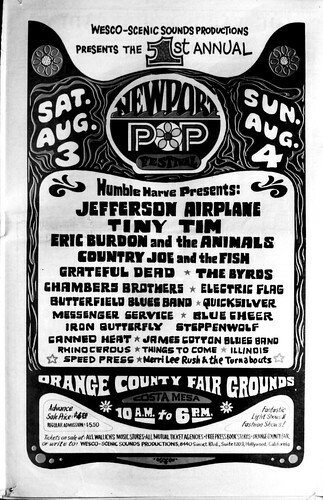 An estimated 140,000 attended the first and probably the last Newport Pop Festival in California's Orange County Aug. 3-4, viewing, among others, Tiny Tim, Jefferson Airplane, Country Joe and the Fish, Grateful Dead, Chambers Brothers, Charles Lloyd, James Cotton Blues Band, Quicksilver Messenger Service, and the Byrds. Although not listed, Eric Burden introduced a local Long Beach,CA band WAR. The festival was regarded musically successful but on other fronts rather less than pleasing. The performers appeared on a raised stage under a striped canopy, but the young crowds were left sitting or standing in a huge, flat, dusty-dry open field under a broiling sun. Refreshment and rest room facilities were less than adequate and the sound system was not powerful enough to carry the sound to everyone present. The highlight of the pop fest on the first day (Saturday) seemed to come when Country Joe closed the bill. The hour was late and Orange County officials were threatening to shut off the electricity when the band went on, finally relenting to give the band time for two songs. As they began their first, "1, 2, 3, 4, What Are We Fighting For," the approximately 40,000 young people still on hand rose as if one, cheering, hands held aloft in the "peace sign." During the second number, a long blues, even the cops on stage were grinning and adlibbing a moderate version of the boogaloo. The second day's climax came when David Crosby started a planned pie fight with Jefferson Airplane. In all, 250 cream pies flew back and forth ... and the thousands of people present stormed the stage to join in. The musical line-up was an impressive one. Besides those already mentioned, bands appearing were Alice Cooper, Steppenwolf, Sonny and Cher, Canned Heat, Electric Flag, Butterfield Blues Band, Eric Burdon and the Animals, Blue Cheer, Iron Butterfly, Illinois Speed Press and Things to Come. But admission to the festival was $5.50 per day – to sit in heat and dust. Most considered it another in the series of pop music shucks. The Newport Pop Festival – which wasn't even held in Newport, but in Costa Mesa – was produced by Humble Harvey Miller, one of L.A.'s Top-40 DJs, and Wesco Associates, basically the same coalition that staged a similarly uncomfortable weekend festival last summer in another Los Angeles dust bin. Among other highlights that concert-goers recall were when helicopters flew overhead, dropping flowers on the audience. And on Sunday, Sonny and Cher arrived by helicopter and were later booed off the stage. Alice Cooper, Canned Heat, The Chambers Brothers, the Charles Lloyd Quartet, Country Joe and the Fish, The Electric Flag, James Cotton Blues Band, Paul Butterfield Blues Band, Sonny & Cher, Steppenwolf, Tiny Tim. During the Charles Lloyd Quartet set, a local group called Super Chief began playing a Lee Michaels song, "Hello," on an alternate stage at the rear of the crowd. Most of the attendees turned around and watched them, as the Lloyd music was not in a popular style. Blue Cheer, Eric Burdon & the Animals, Grateful Dead, Illinois Speed Press, Iron Butterfly, Jefferson Airplane, Quicksilver Messenger Service, The Byrds, Things to Come. Lovin' Spoonful, Rhinoceros, Sky Pilot and The Turtles were not listed on the official poster for the event, but there is published evidence indicating these bands may have played at the festival. The 1969 festival was intended to be the successor to the Orange County event, hoping to capitalize on the brand name and market momentum generated in 1968. A move of venue was necessary because the 1968 event had fallen in disfavor with local community leaders. Three days after the 1968 event, the Costa Mesa City Council vowed to prevent a Newport Pop Festival encore. "To say that we would not like it back here would be the understatement of the year," said Costa Mesa Mayor Alvin Pinkley. Attended by an estimated 200,000 fans on June 20–22, 1969, this festival was the largest pop concert up to that time and is considered the more famous of the two Newport Pop Festivals, possibly because of the appearance of the top-billed Jimi Hendrix Experience. Booker T. & the M.G. 's, The Chambers Brothers, The Flock, The Grass Roots, Johnny Winter, Marvin Gaye, Mother Earth, Jimi Hendrix jam with Buddy Miles, Eric Burdon and Mother Earth, Poco, The Byrds, The Rascals and Three Dog Night. ^ Roderick, Kevin. "Hendrix at Devonshire Downs". LA Observed, June 21, 2007. Retrieved January 13, 2013. ^ Beardsley, Jim A. "Newport '69, a retrospect". LA Observed, June 17, 2009. Retrieved January 13, 2013.